Just one day after Halloween and the largest coffee-selling franchise has already unveiled their brand new holiday-themed coffee cups. This year Starbucks has elected to stray away from the heavily red-based design from a year ago, and instead take a more artistic and festive approach. 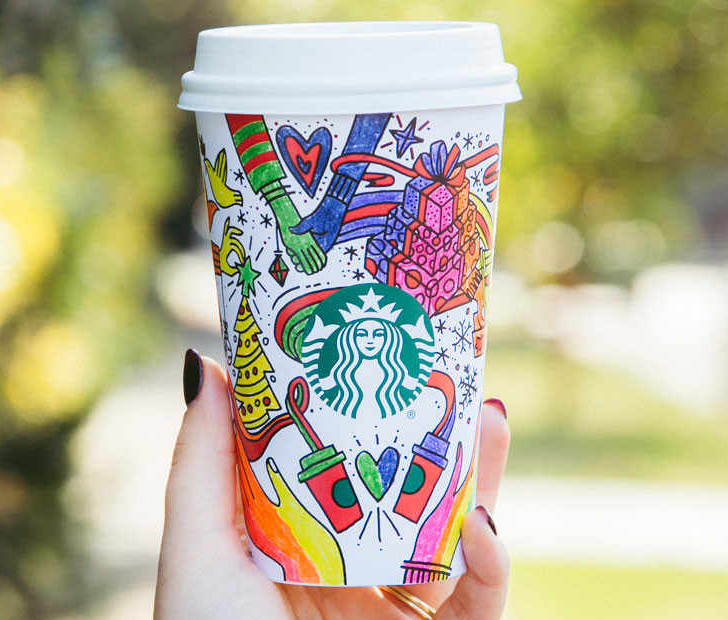 Not only are this year’s graphics more detailed, but they also serve as a canvas for the most creative of Starbucks’ customers. The primarily white cups feature black and white hand-drawings that also highlight a red ribbon running around the circumference. The drawings consist of a stack of presents, a Christmas tree, and flurrying doves and snowflakes, all of which can be colored in if the drinker desires. With the green Starbucks logo and red ribbon being the only colors featured on the cup, customizing will be fully encouraged. An example design has already been promoted to showcase the whole rainbow spectrum within the white cup’s solid figures. And with the return of the holiday themes, we can now fully expect the Caramel Brulée, Chestnut Praline, and Peppermint Mocha Lattes to take over the Pumpkin Spice flavor on the seasonal menu. Though the holiday cups seem to spur a controversy nearly every year, this year’s seem to be more accessible than ever. If you remember, back in 2015, the almost completely red designs didn’t feature enough holiday themes, while last years’ took a more subtle approach by adding the green and white snowy themes that made customers a little bit happier. But this year, Starbucks has left the ultimate customization up to its customers, so they have the ultimate control over the amount of festive content on their cups. What do you think of the new Starbucks holiday-themed designs? Sound off in the COMMENTS and SHARE this article on FACEBOOK to see what all your coffee-loving friends think! Next ArticleCould You Be Spreading Major Germs When Blowing Out Your Birthday Candles? Starbuck Releases Second Seasonal Cup!